While building Nirvana’s iPad app I revisited some of the decisions made working on the iPhone version. This time around, decided to go with a more event-driven design. Titanium has a global event system, so on the surface that would seem like a good choice. Just use Ti.App.fireEvent/addEventListener and you’re good to go. There seems to be some overhead associated with using Ti event system. Any data you pass has to cross the Kroll-bridge. You can only pass ”JSON-serializable data when firing events”. So this means no passing around Ti objects when firing events manually. You always need to pass in a callback object for removeEventListener. You can’t just remove all events for a type. I decided to give Emitter a try, from the Component library. It’s fairly straight-forward to use. I whipped up a little example test script to compare use of Emitter vs Ti events. Speed wise, Emitter runs the 10000 events faster than the Ti events. With any choice there are advantages and disadvantages. In the example code, if you up limit, ie: 100000, there’s a good chance, you’ll blow the stack - so that’s something to be aware of. You can wrap the event.emit in a setTimeout(f, 0). In that case, the performance is on par with Ti’s event system. One advantage of using Emitter is you can actually pass around Ti objects and functions. Since we’re not going over the bridge, you can pass pretty much anything, as opposed to only serializable data. This makes it more straight-forward to decouple the pieces of your app. eg: I use a popover, which is shown from a main controller. You can then dive further into the details, and make edits. Rather than keep track of the popover on a global and use it directly when needing to add/remove a view from different areas, the popover just listens for ‘popover:add’ & ‘popover:remove’ events to add/remove views. And the TiView itself is passed around as part of the event data. No global juggling involved to get a reference to those views. The callbacks are executed immediately. That can be a benefit or a drawback, depending on how you use it. I’ve found it helpful to be assured of some events happening in sequence, especially when dealing with timing & redraws in Titanium. Something wrong? Something right? Let me know in the comments. Here is a gentle introduction to the js debugger, and an example of some neat things you can do with it. Below is the script we will be debugging. The problem in this case is clear (the extra \n in value). We’ll go through the steps you would use to find this problem with the debugger. 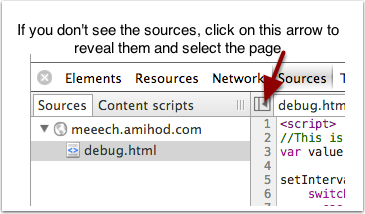 You can load this script and follow along: http://meeech.amihod.com/debug.html. Pretend value is actually coming from a remote source. You inspect the response and don’t notice the carriage return. We’re expecting that our script will show “Hang in there!”, but instead, we keep seeing “No good!”. Click on the Source tab. Here is where you can find all the scripts running on a page. [The sidebar might not be showing- make it show by clicking on the arrow]. Select the debug.html page. First thing we want to do is see what the switch statement thinks its value is. Let’s go ahead, and add a breakpoint. To add a breakpoint, click on the line number - in this case, line 6. The blue mark is showing a breakpoint. Even if you reload the page, the breakpoint will remain. The script will now pause when it hits the breakpoint - you now see a red mark. Over on the right in Watch Expressions, you now see value. And you can clearly see the carriage return symbol that’s part of value. And we’ve found our problem. But that’s not all! While we’re here, let’s just make sure our switch statement works, given the right input. We can change what’s inside value without reloading the script. Inside the console type value='hang'. Then, start the script running again by click on the Play button over on the right. 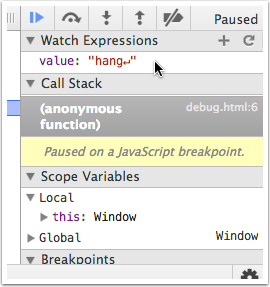 You should now see “Hang in there!” on the page, and the script will pause again at the breakpoint. This time, put value='up' and click the Play button again. This only scratches the surface of what you can do in the debugger - click around the panels on the right. Hopefully this will help you get started using it. Bye bye posterous, hello octopress! Just a simple test post. Using rbenv to run ruby 1.9.3-p327 on OSX 10.8, I kept hitting this error in a rails app I was working on: Faraday::Error::ConnectionFailed (SSL_connect returned=1 errno=0 state=SSLv3 read server certificate B: certificate verify failed): This wasn’t happening under system ruby 1.8.7. I found a lot of rvm specific info, but not much on fixing for rbenv. First (unsuccessful) solution I tried installing updated openssl (via brew) & to rebuild ruby using CONFIGURE_OPTS=--with-openssl-dir=`brew --prefix openssl` rbenv install 1.9.3-p327. Again, no luck - same error. What finally worked was downloading the cacert.pem from http://curl.haxx.se/ca/. Install it where you want (i stuck it in /usr/local/etc/). Then, just add export SSL_CERT_FILE=/usr/local/etc/cacert.pem to your .zshrc (or .bashrc) and you will be good to go! Hope this helps save you some time. If you’ve discovered a better way, share it in the comments! The only drawback to using this method is you can’t use ‘systemButton’ styles. Been spending some time looking into metafields. Here’s something worth knowing to make your life easier. When updating metafields on a product, turns out Create acts like Modify or Create if it doesn’t exist. As long as the namespace and key match an existing metafield on the product, the value will be updated, otherwise it will be created. If you know of a good case when to use the Modify call, I’d love to hear it. Do you work with the Shopify e-com platform? You in Montreal? Then join us (myself and Dave Lazar) for a meet & drink! We’ll be talking shop, trading tips, and other general silliness. All are welcome. Started a project a back in Feb - a MailChimp TextMate bundle. Overall, it’s gone pretty well - I levelled up in bundle making. the project also couldn’t have come at a better time - i’m working a lot with MailChimp on the campaign side, so I will be using the bundle a fair bit day-to-day. This post up on the MailChimp blog has some good getting started instructions. Anyone interested in writing a textmate bundle with php should have a look at the code - I’m pretty happy with the structure of this one. Just a little update. Been a bit silent over here, since pretty deep in Happy Stuff these days. Happy Stuff is based around the idea that many of us have things we’re done with, but they still work, so we don’t want to throw them out. Someone else could use that stuff, you just don’t know who. Happy Stuff is the easiest way to connect you to people in your area that want that stuff. Come on over and check it out. We’re in closed testing right now, but sign up and we’ll let you know when we letting people in your area in. You can also follow @happystuff for updates. The problem is Name needs to match the last part of the Application Id.